Been to Las Vegas? Chances are, if you have have visited the gambling capital of the USA, you’ve heard of Binion’s Horseshoe Casino. This famous family owned casino was one of the first gaming operations in Las Vegas history. It still remains open to this day found in the “Old Downtown” section of Las Vegas. One of the main attractions of Las Vegas “back in the day” was Binion’s famous $1,000,000 display. It consisted of 100 $10,000 Federal Reserve Notes mounted in front of a decorative horseshoe. In its multi-decade existence inside the Horseshoe Casino, the display had been photographed thousands of times. 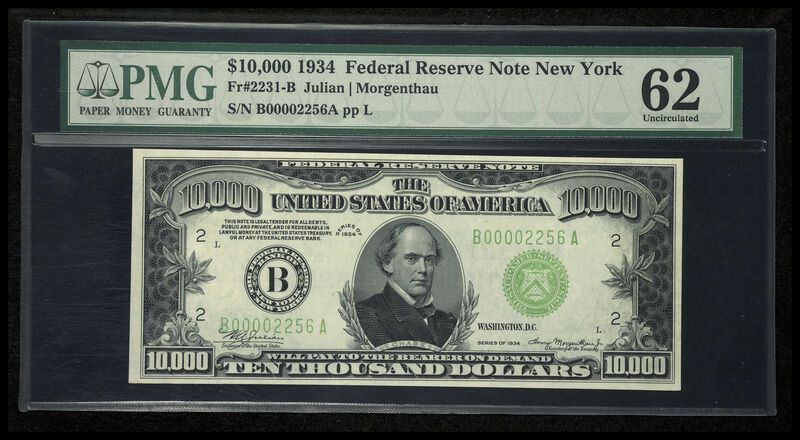 Customers were awe struck by 100 of the highest denomination bank notes ever printed for general circulation. In the late 1990s the casino dismantled and sold the display due to financial shortfalls facing the business. The notes were sold to one buyer who later sold them off into the collecting fraternity. Now, it’s not uncommon to see examples from Binion’s hoard at major auctions. The condition of most Binion notes is uncirculated. A few approach Gem quality, but miss on account of small pinholes introduced into each note in order to create the mounted display. Initially CGA slabbed all of the notes. In time the Binion notes found their ways into other third party grading jackets (PCGS or PMG). These more prestigious grading companies eventually found faults overlooked by the initial CGA inspection: some collectors attempted to repair the tiny pinholes, but their restoration efforts fell far short of satisfactory. As a result, many Binion notes carry the dreaded “Apparent” (Red PCGS) or “NET” (PMG) designation. These examples are more affordable than their untouched counterparts, although an altered Binion $10K will in most cases fetch at least $80,000 USD including the buyer’s premium at a major auctions. Up for grabs this April! Although an opening bid hasn’t been established for this note (look for a number by March 30th, when the auction opens for internet bidding), our guess it will start around $85,000 USD and probably realize $90,000 – $105,000 USD with the buyer’s premium. There will also be hundreds of other notes available for purchase for those on a more conservative budget! PaperMoneyAuction.com receives no compensation for posting this article about a Heritage Auctions lot. The article is merely written for news and entertainment purposes only. Interested buyers should contact Heritage Auctions (http://www.ha.com) directly.